His longstanding friend and fellow composer Ralph Vaughan Williams introduced every number, and this lecture-concert was given by amateurs from London’s Morley College [for Working Men and Women], rather than some top-notch orchestra with a professional chorus and soloists. Such was Purcell’s standing at the time. I might never have known these startling facts had not a friend of a friend sung in Morley College’s centenary concert celebrating this event, which was given in September. The Fairy Queen (see this whistle-stop tour) was first performed in 1692 at the Queen’s Theatre, Dorset Gardens, in London. 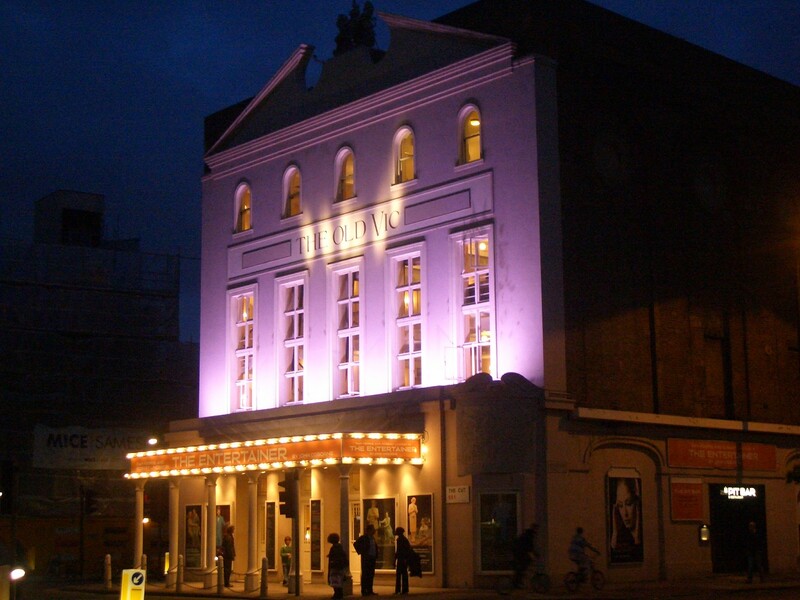 It was a very lavish and costly production, and the Theatre Royal alone had put in £3,000. But, as the 1911 Daily Telegraph reviewer wryly commented, it turned out to be a succès d’estime – a popular success and a financial disaster. The Score of Musick for the Fairy Queen, set by the late Mr. Henry Purcel [sic] and belonging to the Patentees of the Theatre-Royal in Covent-Garden, London, being lost upon his Death, whosoever shall bring the said Score, or a true Copy thereof, to Mr. Zachary Baggs, Treasurer of the said Theatre, shall have twenty Guinea’s for the same. There was apparently no response, for the work was never revived as a whole. Fast forward to around 1900. 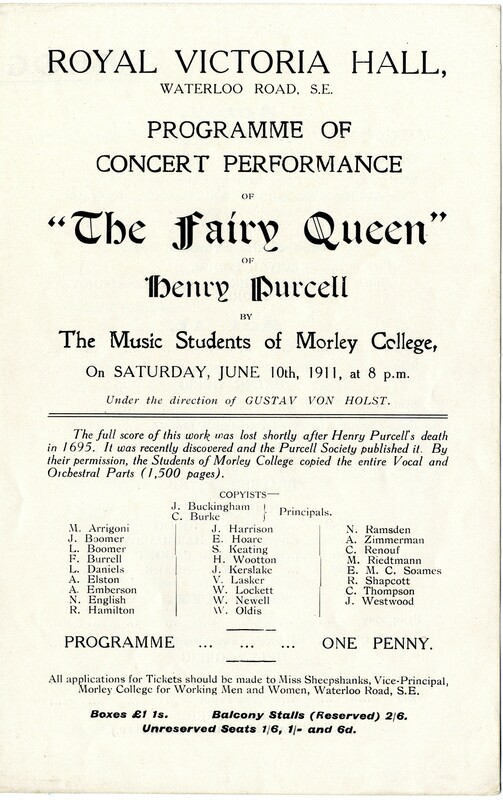 The Purcell Society, which had started to publish its definitive scores in 1878, decided that The Fairy Queen was to be edited by the music critic J.S. (John South) Shedlock (1843–1919). … the conjectural reconstruction of the score had been prepared and engraved, when, by a singular piece of good luck, there was found [by Shedlock himself] in the Library of the Royal Academy of Music a MS. volume which turned out to be none other than the long-lost score advertised for two hundred years ago. Shedlock, of course, incorporated the rediscovered material (the ninth source) into his edition, which must have necessitated many new plates and repagination. Inside the cover of the rediscovered score two names were written: “Savage” and “R.J.S. Stevens, Charterhouse, 1817”. Shedlock deduced that the first name belonged to William Savage (c.1700–1789), a bass singer who had studied with J.C. Pepusch, a composer connected with the Theatre Royal, Drury Lane, at the beginning of the eighteenth century and an enthusiastic collector of musical manuscripts. Savage probably obtained the score from Pepusch and then it passed on to Stevens, who had been educated in the choir at St Paul’s Cathedral, when Savage was Master of the Choristers there, from 1748 to 1773. It was Stevens (1757–1837), organist of the Temple Church and Professor of Music at Gresham College, who bequeathed the score to the Academy. This is the second time that Stevens appears in this blog. The Amati violin owned by Edmund Fellowes previously belonged to him, and he had scratched his name on the back, from which we can gather that he was quite keen on labelling his possessions. Lucy Broadwood (folk-song collector and great-granddaughter of John Broadwood, founder of the piano manufacturers), who was also present, wrote in her diary that “Evangi Florence and Mr O’Sullivan sang well … The Purcell Operatic Society was monstrously bad and the tenor also”. But The Fairy Queen, which was re-published in 1903 in full score, remained unperformed, as a complete work, until Holst began his project, first announced in the Morley College Magazine in September 1910. As there was no performing material, “a little army” of volunteer student copyists was enlisted. This mammoth task took several months and was complicated by the fact that many of the vocal parts had to be transposed, given the lack of countertenors and the untrained voices of the choir. The end result was 1,500 pages of manuscript; the names of all the scribes were mentioned in the programme. Sixteen weeks of rehearsals followed, and the first modern performance was given at the Old Vic on 10 June 1911, “before a highly musical but far from full house – [as] it is always easier to find performers than audiences at Morley …” (according to Denis Richards in Offspring of the Vic, 1958). Despite the lack of male altos, one song, “One charming night” (Secrecy’s Air in Act II), was sung at the original pitch, according to The Times, “by Mr. Ernest Raggett, a high tenor with remarkable easy production”. This expedition into early music wasn’t a one-off for Holst, who was Music Director of Morley College from 1907 to 1924 and gave his services for free. Holst insisted in providing a rigorous diet of “proper” classical music and “firmly declined to pander to the then existing taste”, according to an interview given in 1921. During his time there, he programmed Bach’s Magnificat, Handel’s Acis and Galatea, some Haydn and Mozart symphonies (unusual at the time), Dido and Aeneas and the Incidental Music to Purcell’s Dioclesian, which was another first modern performance. Together with Vaughan Williams, with whom he’d been friends since their time as students at the Royal College of Music, he successfully staged performances at Morley College of extracts from Purcell’s King Arthur, Bach’s Christmas Oratorio and Gluck’s Orfeo ed Euridice. They both shared a keen interest in Purcell (RVW even edited a volume of Welcome Odes), madrigals and the Tudor composers, no doubt helped along by Edmund Fellowes’ enthusiasm and active promotion of his own work. Holst and Fellowes did meet at least once. These influences certainly affected Vaughan Williams’ composing style more obviously than Holst’s, perhaps as a result of his work on The English Hymnal. In any event, John Alexander Fuller Maitland music critic and co-editor of the Fitzwilliam Virginal Book observed that in Vaughan Williams “one is never quite sure whether one is listening to something very old or very new”. Thanks are due to Elaine Andrews and Edward Breen at Morley College and to the library staff of the Royal Academy of Music.